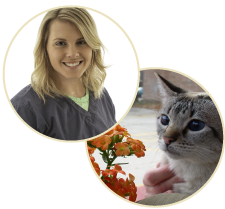 Ashley joined the Whole Pet team in 2013 as a veterinary technician assistant. She graduated from UW Madison in 2014 with degrees in Biology and English/Creative Writing. Her experiences working with owners and their pets at Whole Pet guided her in pursuing her veterinary medical education at the UW Madison School of Veterinary Medicine. Upon her graduation in 2022, she aims to practice with the level of compassion and enthusiasm she has been fortunate enough to be exposed to here at Whole Pet. She has strong interests in behavior as well as preventative medicine and she hopes to pursue skills in these areas. When she’s not working or studying, Ashley enjoys running, knitting, discovering new restaurants, going to concerts, and dreaming of her next travel getaway!